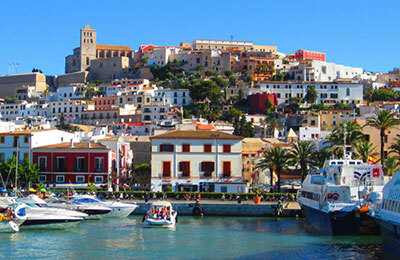 Aquabus Ferries operates ferry services between Balearic Islands. As well as comparing prices and times for Aquabus Ferries, we'll also show you results for alternative operators, such as Balearia and Mediterranea Pitiusas to help you get the whole picture. 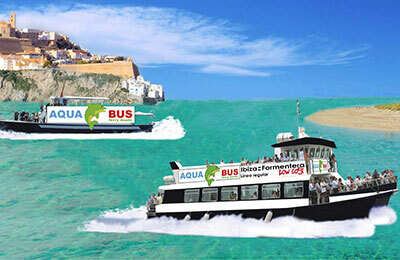 The only Aquabus Ferries crossing is Formentera to Ibiza in Balearic Islands with 4 crossings daily. Departures are available between 10:15am and 10:00pm. The size of the Aquabus vessels allows them to sail close to shore, giving passengers superb views of the Ibiza and Formentera coastlines from the top deck, where there is ample seating. Aquabus prides itself in providing a relaxed family atmosphere on board, on a sailing that takes just 40 minutes, making the trip a great choice for people travelling with children. Aquabus was founded in Ibiza in 1985, to provide a family friendly, low cost service to the nearby island of Formentera, without compromising on quality of service. Whether you use the Ibiza Formentera ferry, or the Formentera Ibiza route, you're bound to have a relaxing and comfortable journey with Aquabus safe in the knowledge that you got a great deal with AFerry. How long before departure should I arrive for Aquabus Ferries?